Netspar is a foundation. Its mission, strategy, action plan, and budget are all determined by partners from the pension industry and academic institutions, under the foundation umbrella. The Foundation’s activities are pursued through the Netspar Center, an operational unit of Tilburg University. Foundation Board: Highest representative body; sets strategy and appoints members to the Supervisory Board. The scientific quality of the Netspar research is evaluated by an independent Scientific Council that reports to the Supervisory Board. 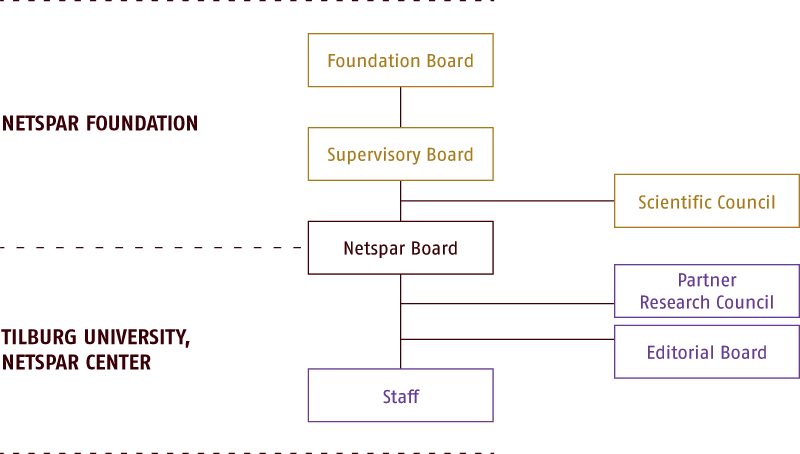 The structure and the composition and functioning of the Foundation Board, the Supervisory Board and the Board are laid down in the articles of association of the Netspar Foundation. The Netspar regulations contain, among other things, the conditions for the partnership and highlight the various bodies. All activities performed by Netspar are managed by the Netspar Center, part of TiU. The Netspar Center has a board made up of a general director, scientific director, a managing director and a general member of the board. The board is advised on research and education matters by the Partner Research Council, on which partners from industry and academia are represented. The Editorial Board, which is also made up of partners, evaluates (and supervises) the industry-specific Netspar papers and advises the board on the Thesis Awards. The research program is coordinated by the program coordinators. They advise the board on the research agenda. Events, communications, relations management, project control, and operations are all handled by the Netspar Center.